Kashmir valley is a jewel in India's crown. Nestling in the lap of dazzling, snow-capped Himalayas, the Kashmir valley is a jewel in India's crown. An inspiration for art, music and poetry, Kashmir is also a honeymooners' paradise, a nature lover's wonderland and a shopper's dream come true. Two major Himalayan ranges, the Great Himalayan Range and the Pir Panjal, surround the landscape from the north and south respectively. They are the source of great rivers, which flow down into the valleys, forested with orchards and decorated by lily-laden lakes. Srinagar, the capital of the state of Jammu and Kashmir, stands by the river Jhelum that forms the lifeline of the Kashmir Valley. The valley of Kashmir is unique in its surroundings which offers breathtaking view of its varying topography.We offer kashmir tour packages and kashmir budget tours to visit kashmir.Nature has endowed Kashmir with exotic beauty, which is reflected in its picturesque landscapes, lush green forests of Chinar, Deodar and Pine trees, beautiful rivers and waterfalls, snow covered mountains and a range of flora and fauna. Infact, it abounds in many varieties of wildlife, which includes Bears, Leopards and Himalayan Chamois etc. The countless species of luxuriant vegetation too, attract lot of enthusiastic botanists. Kashmir also has a lot to offer to the artists, archaeologists, rock and mountain climbers and big game hunters who throng this place in large numbers. Besides this, it is an ideal place for holidaymakers as well as for people who seek tranquility and peace amidst natural surroundings. No wonder that, Kashmir is referred to as the 'Switzerland of India. 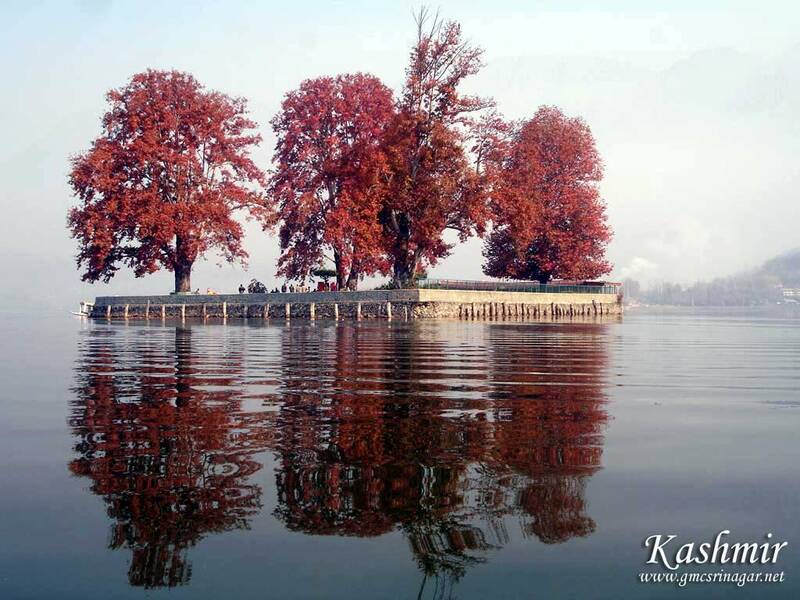 Kashmir has four distinct seasons, each with its own peculiar character and distinctive charm. These are spring, summer, autumn and winter. Kashmir is a land where myriad holiday ideas are realized. In winter, when snow carpets the mountains, there is skiing, tobogganing, sledge- riding, etc. along the gentle slopes. In spring and summer, the honey-dewed orchards, rippling lakes and blue skies beckon every soul to sample the many delights the mountains and valleys have to offer. Golfing at 2,700 m above the sea, water-skiing in the lakes and angling for prized rainbow trout, or simply drifting down the willow fringed alleys of lakes in shikaras and living in gorgeous houseboats are some of the most favored ones. Spring-which extends roughly from March to early May, is when a million blossoms carpet the ground. The weather during this time can be gloriously pleasant at 23oC or chilly and windy at 6oC. This is the season when Srinagar experiences rains, but the showers are brief. Summer Extends from May until the end of August. Light woolens may be required to wear out of Srinagar. In higher altitudes night temperatures drop slightly. Srinagar at this time experiences day temperatures of between 25oC and 35oC. At this timethe whole valley is a mosaic of varying shades of green - rice fields, meadows, trees, etc. 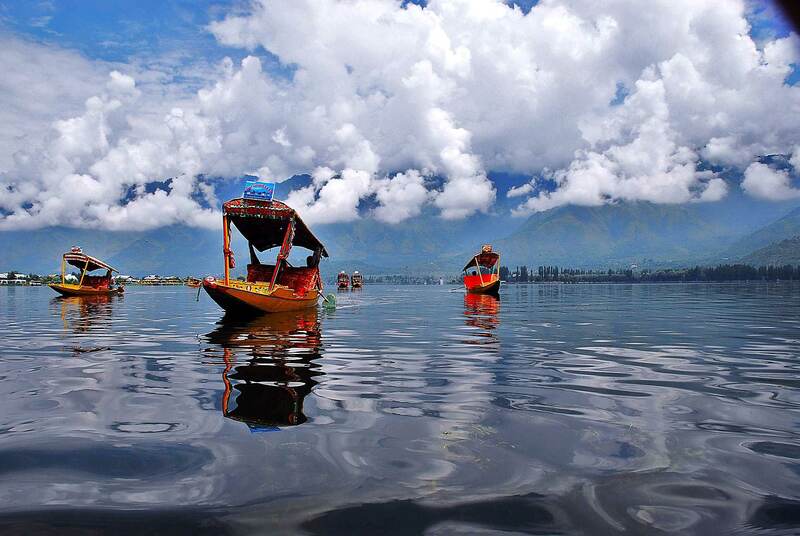 and Srinagar with its lakes and waterways is a heaven on earth. en Srinagar experiences rains, but the showers are brief. The onset of autumn, perhaps Kashmir's loveliest season, is towards September, when green turns to gold and then to russet and red. The highest day temperatures in September are around 23oC and night temperatures dip to 10oC by October and further drop by November, when heavy woolens are essential. From December to the beginning of March is winter time, which presents Srinagar in yet another mood. Bare, snow-covered landscapes being watched from beside the warmth of a fire is a joy that cannot be described to anyone who has not experienced it. Some houseboats and hotels remain open in winter-these are either centrally heated or heated with bukharis, a typically Kashmiri stove kept alight with embers of wood, quite effective in the winter.